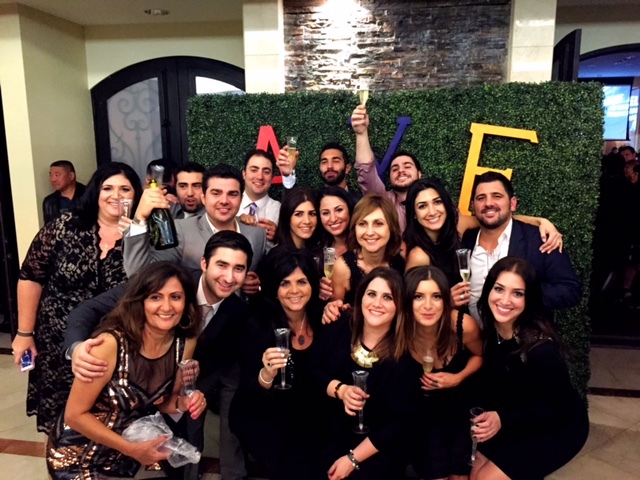 MONTEBELLO, Calif.—Over 700 guests gathered on Saturday, Nov. 22, in Montebello for the much-anticipated Armenian Youth Federation Alumni Reunion. The AYF Alumni Reunion took place in Montebello’s Bagramian Hall and featured The Kef Time Band, as well as musical and dance performances by current AYF members and alumni. The reunion was organized by the AYF Montebello “Vahan Cardashian” Chapter as a celebration of the local chapter’s 56-year history and as a tribute to the larger AYF organization’s 81 years of worldwide service and action for the Armenian people and cause. The AYF Montebello “Vahan Cardashian” Chapter will be donating part of the proceeds from the event to AYF Camp and the AYF Youth Corps program, the latter of which is celebrating its 20th anniversary. AYF Camp has been active for over 40 years and established its current location, Camp Big Pines, in 1977. Throughout its history, AYF Camp has offered a genuinely rewarding experience by serving as a place for Armenian youth to make new friends and memories of a lifetime. AYF Camp is the largest and oldest Armenian summer camp program in the Western United States. In 2012, AYF Camp expanded to include a day camp in Los Angeles, spanning four weeks throughout the summer. The AYF Youth Corps program began in 1994 after a ceasefire agreement was reached in the Nagorno-Karabakh conflict. Commencing with nine volunteers in the newly liberated region of Artsakh, volunteers helped rebuild schools and orphanages in war-torn villages. In 2008, the program transitioned to a day camp for underprivileged youth in Armenia modeled after AYF camp. To date, some 200 Youth Corps volunteers from the United States have participated in the program, impacting thousands of young Armenians in the homeland. Spanning a five week period throughout the summer months, day camp locations currently include Gyumri, Proshyan, Martuni and Stepanakert in Artsakh, and for the first time in 2014, the border village of Baghanis.